Light from the afternoon sun danced through dreamcatchers while incense burned – and just for a moment, Robinson’s Park seemed worlds away from Masterton’s main drag. 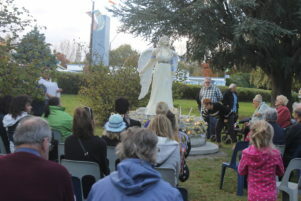 It was the homecoming of the statue of Grace, the brainchild of Masterton woman Elaine Hurndell. She had spent $15,000 and the past two years completing the sculpture, which she had moulded from her daughter, Montana. Last Saturday afternoon, the nine-foot sculpture was officially welcomed into its permanent place in the park, much to the delight of Masterton residents who felt the concept helped them grieve the loss of loved ones. The ceremony, led by Graeme Burnard included waiata, a crystal sound bath producing ethereal tones, and candle laying. “From today this indeed will be a special place because Grace has come home,” he said. “There are lots of words and meanings for the word Grace, but for me, it simply means an enabling power that strengthens us from day to day. Speaking of behalf of Elaine, he said it was the response from the community that had enabled Grace to find a permanent home. “Elaine made a promise… to create an angel to radiate the love this town so desperately needs. Ms Hurndell said she believed many friendships would be created at the base of the monument. “It is a place to let your guard down and be yourself. “It is a place to talk to the person next to you, and to find strength and support from others. Ms Hurndell had originally hoped the statue would be placed in Hosking Garden in Queen Elizabeth Park, but this was not approved by Masterton District Council. In a bid to warm people up to the idea of the handmade statue, Deputy Mayor Graham McClymont “snuck” the statue into Robinson’s Park just before Christmas for a two-week trial. This location, which sits adjacent to Farriers Bar and Eatery, “ticked all the boxes” – there was wheelchair access, it was next to a peaceful stream, there was lots of parking, and it was relatively private. The statue’s placement was given the green light by council at the end of February. Mr McClymont, who attended the weekend ceremony, said there were only “one or two Elaines that turn up in a lifetime” – “I was lucky enough to have her show up in mine”. “It’s been a long journey, and so many different routes led to this happening,” he said. One of Mr McClymont’s friends had helped Ms Hurndell make moulds, and Mr McClymont himself had offered up his concrete yard as a place to cast the angel statue. “She turned up at council, did submissions… too many paths crossed and, in the end, I bought into Elaine’s absolute passion for this project. “It got stalled… councils are painful places – we have things called procedures and processes, and it just dragged on and on. 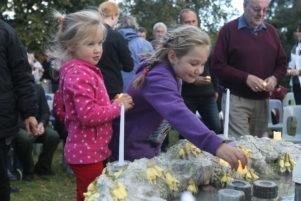 In fact, about 40 people turned up to the ceremony to lay a candle at the monument. 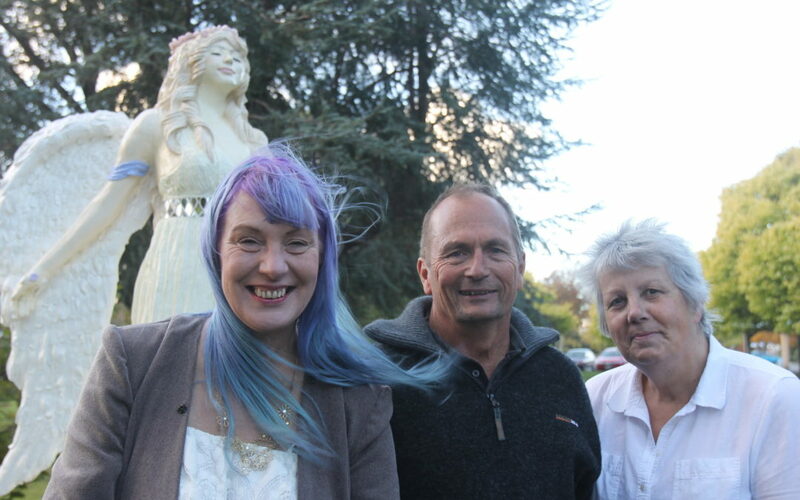 One was Fay Evans of Masterton, who said she felt the statue provided “balance to life itself”. “My son died of cancer at the age of 24. Elaine said she was toying with the idea of having regular events at the statue to bring people in the community together.